Steven Johnson wrote this in Where Good Ideas Come From. He was talking about how developing nations experience a much higher infant mortality rate than the United States. What’s responsible for the gap is not just that these machines come with a $40,000 price tag, but rather, it’s the lack of spare parts and the lack of technical expertise required to repair them when they break, which they’re all but guaranteed to do. Some studies suggest that 95% of medical technology donated to developing countries breaks within the first five years of use. I love this idea of creating something that is built to break in a non-catastrophic way. The parallels in investing are obvious. And 4% in one hundred seventy-two days (shown in chart below). A 4% daily decline has happened on average every 82 days. But we know from the way markets work that these occasional breaks will go dormant for a while and then re-appear in a series of blows to the gut that will test every investors’ toughness. 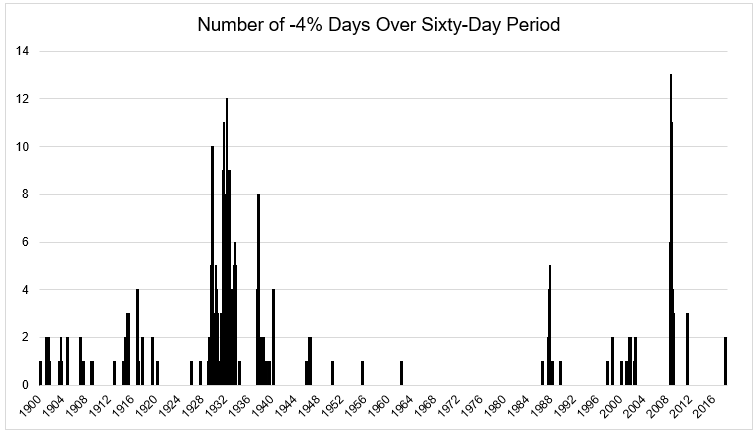 The chart below shows the number of -4% days over rolling sixty-day periods going back to the first days of the twentieth century. Thinking in percentages is abstract so it’s helpful to convert it to something we can better understand. 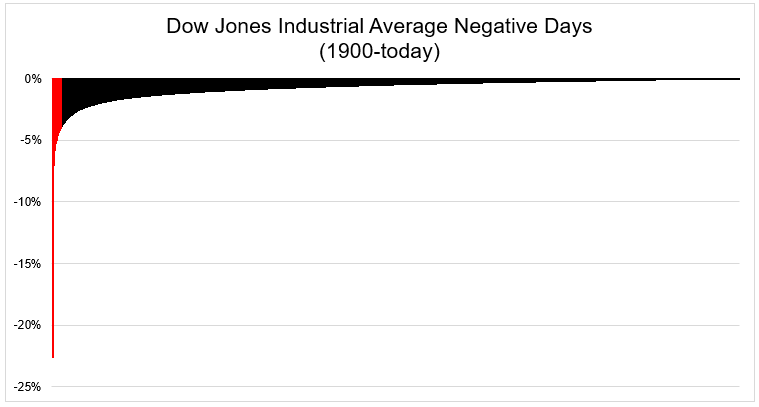 A 4% decline today would represent 1,057 points on the Dow. We recently experienced two -4% days in early February, 2018. The VIX hit 50 and the fear was palpable. If you know that markets break, and you know that broken markets break our investing compass, then it makes sense to really take the time to determine how much risk you need to take, because taking too much risk can cause you to forget why you’re taking risk in first place. This is the most important question investors need to ask and it’s also one of the hardest to answer. Knowing that markets break sometimes doesn’t make dealing with broken markets any easier. But if we know that broken markets are eventually repaired, then it would behoove us to build a portfolio that breaks in a non-catastrophic way, giving us the ability to hang around until the time that they are fixed.